I recently returned from a visit to NYC where I visited my brother and attended a friend's wedding in the Boston area. Good times were had, especially on the drinking front. The first night I was in New York, I went out with my brother, his girlfriend and one of her friends. It was happy hour at the Boxcar Lounge, which means two-for-one drinks. I noticed a bottle of Hendrick's gin on the shelf. As it's something I had wanted to try for a while, I ordered a G&T. Turned out to be incredibly tasty. The drink was almost perfectly balanced, with the cucumber notes pleasantly highlighting the other elements. I got another one for my second drink and ended up spending $15 including tips. 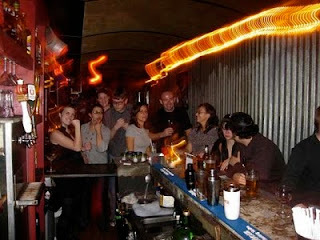 The space is fairly narrow, though there is also a small patio behind the main part of the bar. While it was a nice place to sit and chat, I can imagine that it would get crowded fairly quickly on a busier night. 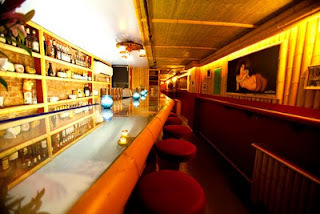 If you're in the East Village during happy hour, I highly recommend this bar. Another fine establishment that I visited, this time a little closer to my temporary home base in Greenpoint, was The Richardson. This bar is set up Prohibition-style, going so far as to have all the bartenders properly attired. Thankfully secret passwords aren't needed to get in. They made me some rather solid daiquiris, which let me try a couple of new rums. The Mt. Gay XO in particular was good enough that I bought a bottle the day after getting back to Portland. The service was excellent and the prices were perfectly reasonable, by NYC standards. Another place that I would highly recommend if you happen to be in the Williamsburg area and fancy a drink. Having heard of the place some time ago, I was really looking forward to drinking at Painkiller. The place has a really solid reputation, despite the fact that it's a pretty new bar. And hey, tiki drinks! I ended up going by myself, but it was still a nice place to sit and read while I filled up on rum. I took a chance and ordered the swizzle flight. Only one of the three really tickled my fancy, but some of that may have been due to the swizzling, which can dilute the drinks a bit more than necessary. Following that, I settled in to a very tasty Jet Pilot. To make it work even better, this one was served with an ice cone rather than being blended, so it stayed very cold without much dilution. At that point I'd had rather a healthy amount of rum, so it was a good thing that I was getting home by subway. With all that said, I did have a few quibbles with the place. The biggest is that the prices for drinks aren't terribly obvious. There's a little chalkboard sign by the bar, but it's pretty easy to overlook. Secondly, the menu doesn't really list the drinks. The bartender and waitress are more than happy to explain things, but it doesn't seem like an efficient system. 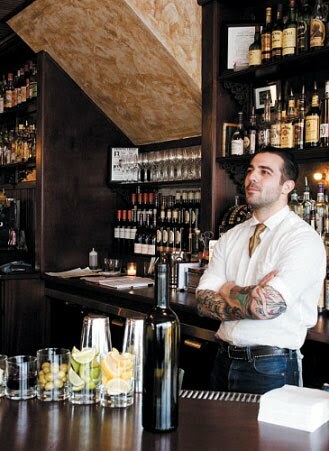 I was pretty O.K., but only because I could look at the more comprehensive list of drink recipes on their website. Still, it's a place that I'd probably go back to. Though I'd probably call it good after one drink. Instead of four. 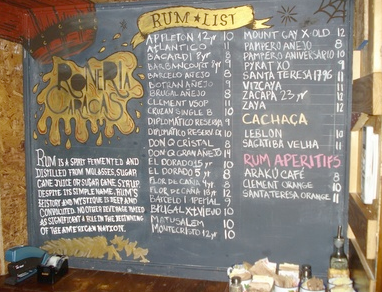 The last place I drank at in NYC was the Roneria Caracas. This is a rum bar that's part of an arepa place. The focus is definitely on the rum and there's an extensive list of rums to sample. The decor was interesting, evoking a place that had been hastily thrown together from found materials, but everything was comfortable and well put-together. The daiquiri I had with El Dorado's 5 year-old rum was interesting (enough that I'm looking to get a bottle for myself), though it was a bit tricky to tell exactly which flavors were due to the rum and which were due to the sugar cane syrup that the bar used in place of simple syrup. Either way, it was tasty and not overly hard on the pocketbook. I didn't sample any of the other drinks, but the menu looked interesting and tasty. Additionally, the arepa I had was also tasty, so this is a good spot, whether you're hungry or looking for a drink. All said and done, I had a pretty good time drinking in NYC. The prices were a little rich for my blood, but that seems to just be a matter of the different cost of living in the city. But I was on vacation, so whatever. If any of you are ever in the city, give any or all of these spots a try. I doubt you'll be disappointed.